As of August 17, Lael has been breathing for as long as I was pregnant with her. Well, okay, if you want to get really technical I guess that's not quite accurate seeing as how she was 3 days late. But who's counting? That question actually makes me laugh now that I think about it. Um, I, for one, was counting every single hour that I went past my due date. Can I get an amen, anyone? 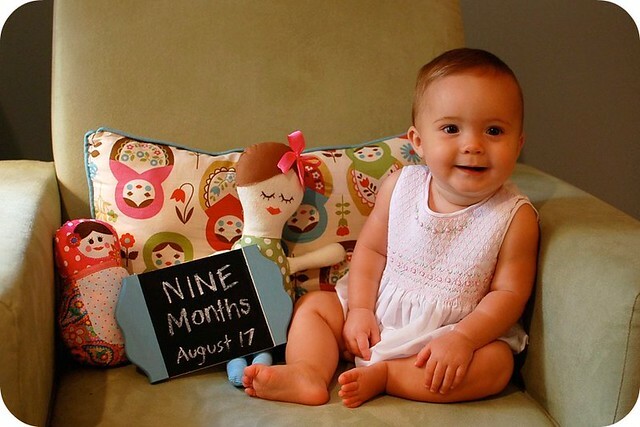 I feel like nine months is really quite a milestone. I can really see this girl's personality shining through and I'm loving what I'm seeing. She is as happy as the day is long. One of my biggest prayers for her and one that I pray daily is that the Lord would place in her a spirit of peace and contentment. My deepest desire is that God will work in her heart at an early age and that the joy that only He can give would dwell within her. She gets more and more beautiful each month! PS- I love these posts! They inspired me to do the same with my own daughter! She is such a beautiful girl!! wonderful prayers from a mother for her daughter...she is a beauty.